We often say that South Sudan is a hard place to work and 2016 proved to be the most difficult year yet. A failed peace agreement in July gave way to deep instability as war and violence spread throughout the country. Annual inflation soared to over 800%, and hundreds of thousands of South Sudanese fled their homes for the safety of the refugee camps in neighboring countries. Uganda alone welcomed almost 500,000 South Sudanese refugees in 2016. As the violence and insecurity escalated over the second half of last year, we were forced to reduce, and eventually suspend, operations at our Yei and Nimule locations. And just this month, we were forced to evacuate from our headquarters in Kajo Keji because of an outbreak of fighting. By God’s grace, our team is safe and has relocated with their families and most of our clients to Uganda. As you know, our commitment has always been to bring economic empowerment and the gospel to the South Sudanese people. To do this, we knew we had to adapt our approach. After careful thought and considerable prayer, God has led us to bring our new savings-led microfinance program to the refugee camps in Uganda. While we grieve the tragic situation in South Sudan, we see a unique need to promote resiliency and dignity for the South Sudanese refugees in Uganda. We will launch our new program in Adjumani, Uganda. There are currently over 200,000 South Sudanese refugees in 16 camps in Adjumani. The refugees there receive some aid, however the food rations and services are inadequate to keep up with the rapid influx and demand. But the South Sudanese are nothing if not resilient. As they save rations and work odd jobs to earn money, businesses are emerging in the marketplaces in the refugee camps. They have hope—but they also need empowerment. Stella is currently working in the refugee camp to provide for her family. 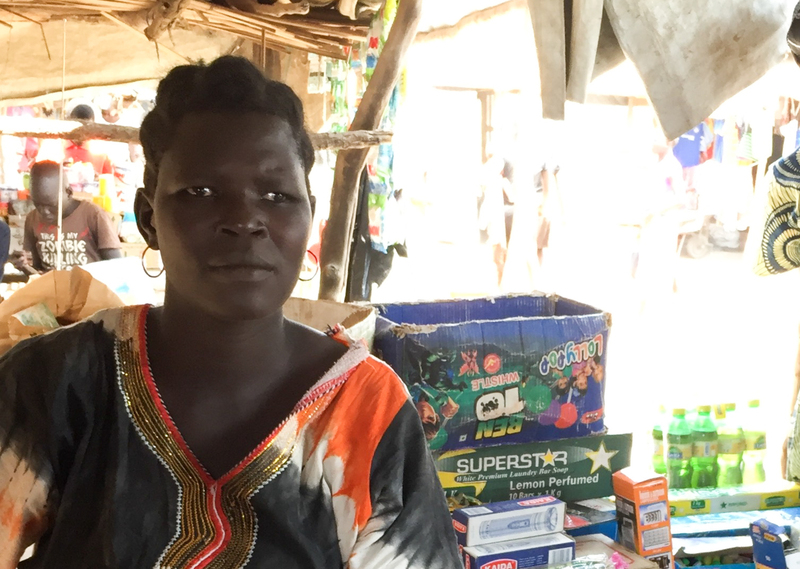 She and her friends tried to start a savings group on their own. But they’ve received no training and don’t have a safe place to save their money. They need us to provide tools and formal training as they seek to rebuild their lives from the ground up. Our savings program will launch in the Adjumani refugee camps as soon as our pending NGO application is approved (approximately 3-6 weeks). We have met with Ugandan officials, local camp leaders, pastors, business owners, and new camp arrivals. They, and we, are excited that Seed Effect will bring savings groups and training to empower the refugees to provide for their families, save for emergencies and start small businesses. In addition, we will continue to work alongside the church in Uganda to bring the hope of Jesus Christ to the South Sudanese refugees. We ask that you continue to pray with us for peace in South Sudan. We are hopeful that we can soon resume our work there. However, given the potential for a long-term conflict, we have suspended our microloan and savings programs in South Sudan and will focus solely on our new savings program in Uganda for the foreseeable future. We will redirect the resources from our South Sudan program to accelerate our expansion in the Ugandan refugee camps. Please trust that we take our responsibility for stewarding this ministry very seriously. We are working hard to continue empowering the South Sudanese through this heartbreaking situation. Thank you so much for your faithful support of Seed Effect and the South Sudanese. Please do not hesitate to reach out to us if you have any questions. Kajo Keji is now a ghost town. This video from UNMISS depicts a stark contrast from the peaceful, bustling town that has been our headquarters since 2009.